We are very happy to welcome you at the Holländer Hof Hotel Heidelberg during the Heidelberg city festival “THE WEDDING” in honour of the 400th wedding anniversary of Frederick V and the English princess Elizabeth Stuart which take place from 9th to 11th August 2013 in Heidelberg’s historic Old Town. Due to these festivities there will be some temporary road closures around our hotel which are unfortunately inevitable. One road closure is on Saturday 10th August 2013 from approx. 1.30 p.m. to 3.30 p.m. due to the arrival of the historic wedding couple by boat at the Old Bridge. They will then take a carriage ride over the bridge directly in front of our hotel, head to town and on to the famous Heidelberg Castle. If you are planning to check-in at our hotel during this period of time (1.30 – 3.30 p.m.) please note that you cannot drive your car in front of the hotel then. Therefore we highly recommend you to drive directly to parking lot number 12 at the cable car station. Our hotel guests benefit from a reduced tariff of EUR 8,00 per 24hours in this specific parking lot only. 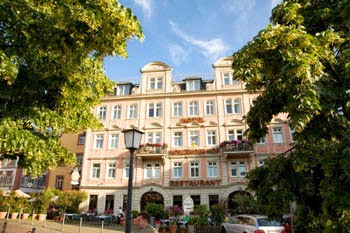 From the cable car station to the Holländer Hof hotel it is only a five minutes’ walk through the historic Old Town. Of course you can drive your car in front of the hotel to unload your luggage later after the road blocking has been reversed. If you arrive by train the easiest would be to take a taxi which will bring you as close to the hotel as possible. We wish you a good journey to Heidelberg and a pleasant stay at the Holländer Hof hotel.